The Campaign for Safe Cosmetics is a broad-based coalition, housed at the Breast Cancer Fund, working to clean up the beauty aisle through public advocacy and market campaigns designed to eliminate dangerous chemicals linked to cancer, reproductive harm and other adverse health impacts from cosmetics and personal care products. Since the Campaign was launched in 2004, we have educated millions of people about the problem of toxic chemicals in cosmetics, which has markedly increased demand for safer products. Now hundreds of companies fully disclose ingredients and avoid the use of cancer-causing chemicals, reproductive toxicants and other unsafe chemicals, demonstrating these practices are not only possible, but profitable. The Campaign’s steering committee is made up of the Breast Cancer Fund, the Alliance for a Healthy Tomorrow (represented by Clean Water Action), Friends of the Earth, and Women’s Voices for the Earth. Promo – Free Ground Shipping! All orders over $50 will receive free ground shipping to the lower 48 states (excluding Alaska and Hawaii). Free shipping terms subject to change, and apply to all products. Elan Sassoon, son of an icon and industry visionary is heading to Australia to launch his revolutionary product line, Sojourn. As part of his tour, Elan will be making 3 appearances at Hair Expo thanks to Australian distributors Phoenix Nationale. Elan’s roots in the salon world are well-known however he is a beauty industry expert in his own right with over a decade of experience working with companies large and small. 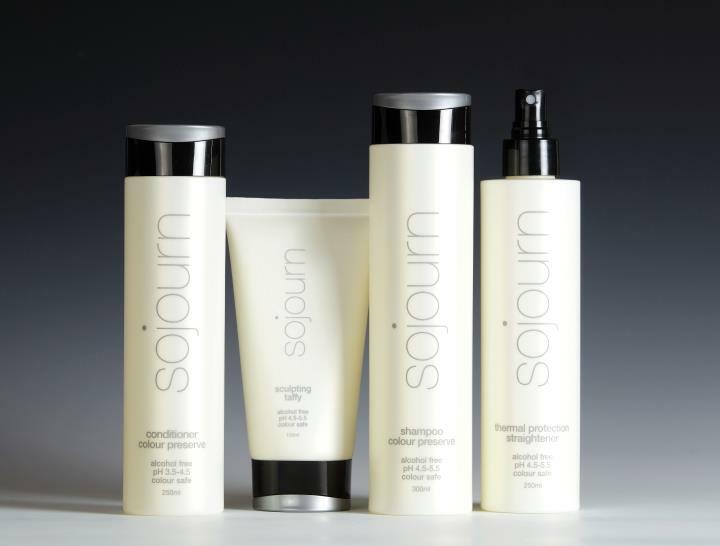 Sassoon’s most recent venture is the creation of the revolutionary product line Sojourn, a truly professional line committed to the protection of hair and the re-education of the industry. Sojourn products possess an unmatched recipe of pH compatible, 100% biodegradable, sulfate, formaldehyde and paraben-free ingredients that complement each other to the highest degree. TEXTURE! Texture is the star in this episode of OFF-Label Styles, as we feature a trio of products to create volume, shine, and definition! My inspiration came from the Ombré hair coloring technique. What inspires you? Let us know on the Sojourn Beauty Facebook, or add me (Sadie Marquez) personally, and let’s talk about your favorite ways to use Sojourn products. Feel free to become a Sojourn Beauty Cutie and post your pictures. Remember, give us two weeks, we’ll give you healthy hair! IT’S NOT TOO LATE! Earn your CEU continuing education hours for ONLY $25. Sojourn is very proud to bring you LIVE education. This online educational experience is accessible to all. We will bring our usual high standard of education featuring hair cutting, product education, and styling, filmed at multiple angles. Register now to view the 2-hour live webcast. 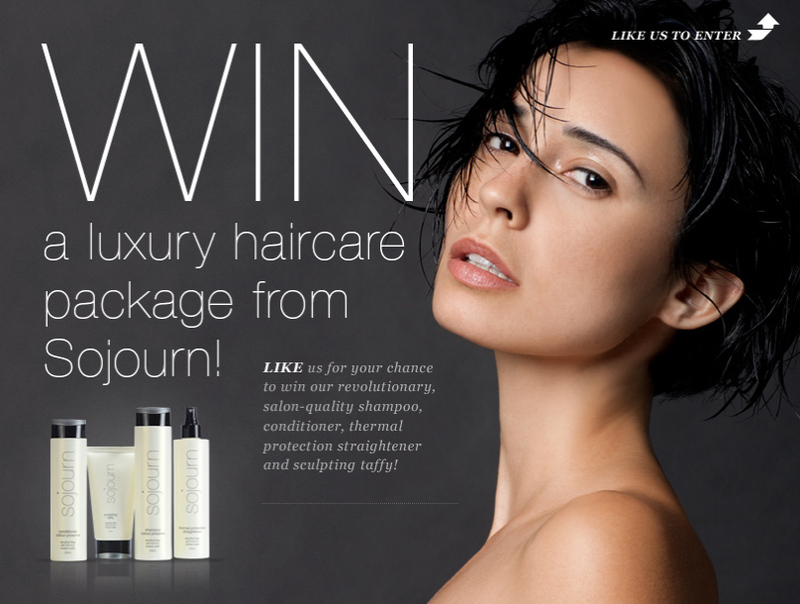 Want to WIN the ultimate experience for your hair? Enter our sweepstakes today for your chance to win our Colour Preserve Collection! Time is ticking, so enter now! 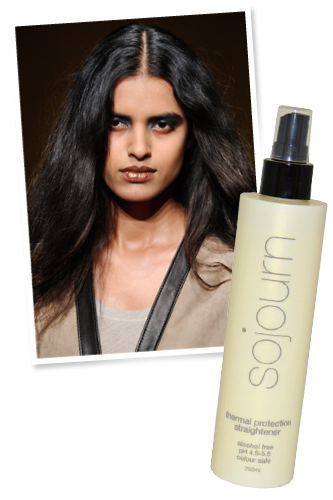 Photo: Maria Valentino/MCV Photo; Product Shot Via Sojourn Beauty. Coarse And Thick Hair “I recommend not washing every day.Your natural oils will work their way down to your ends (Really! Once or twice a week is fine.). When you do shampoo, wash twice. It’s harder to get through, and really get a good scalp cleansing when there is a lot of thick hair.Sojourn Thermal Protection Straightener, $24, available at Shine . *Fire-engine red hair? Chemically-treated? The secret to long-lasting colour and treatments is Colour (white)! When coloring hair, closing the cuticle to seal in and protect the color is a must. A lower pH scale will help with this. A slightly acidic pH (3.5-4.5) helps seal the cuticle and prevent fading. To maintain, restore hair to its natural pH level (4.5-5.5) when shampooing and conditioning. – Rob Guimond, Director of Chemistry.